Q. First, happy birthday to you. Q. I have a question from Henri Leconte. He wanted to know what made the difference today in the match. RAFAEL NADAL: Always in these kind of matches is small things. But I think I started the match playing fantastic the first set. After the 5‑1, I think I started to have few mistakes. I lost a little bit the way that I was playing since that moment. I had two bad mistakes with the 5‑2, 30‑15, one with backhand down the line and one with the forehand with the 30‑All long. After that, he played well the next game. Serving against the wind with 5‑4 was a tough match. It was a crucial game, my opinion, no? Because with the first set for me, you know, the match gonna be long always. In normal conditions that can't help me, no? Q. You saved 15 break points out of 18. You made 6 breaks out of 13. Do you think that the key is that you made always the most important points, you played better the most important points against him? And second, did you watch the first set of Federer? What do you think? 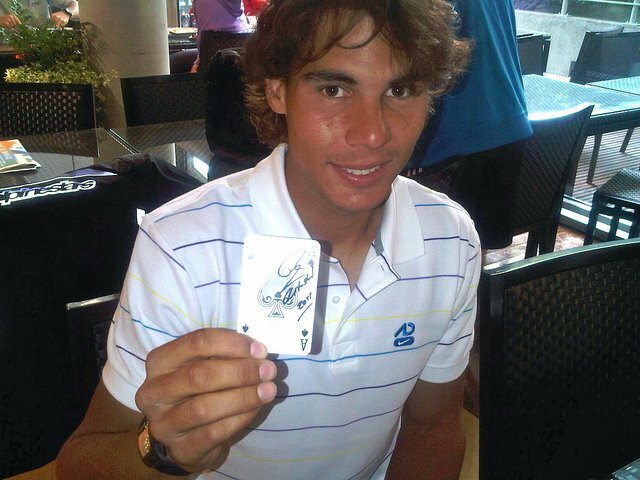 RAFAEL NADAL: Is true, I saved a lot of break points. I played well in important moments. But another thing that's true, I was all the time with the score in my favor. So I was up in the match all the time. I had 5‑1 in the first set. In the second set I was break the beginning, another break, so all the time he never was break for him in no one time during the match, no, that's true. But anyway, he had good chances. In the third set I had to save a lot of important moments with my serve. In general, I think that's something important. I said before, no, to win these kind of matches are always the small things, and the player who plays better these kind of points or who has a little bit more lucky in these kind of points has better chances to win. Today I did. For that reason, I am in the final, no? I saw the first set, yeah. It was good quality of first set. Yeah, always. Q. The conditions, they were slightly similar to the final of Indian Wells a couple of years ago in the wind. Q. Not quite that much, perhaps. But in terms of trickiness of playing in that wind on this court with the dust blowing around, how hard was it out there today? RAFAEL NADAL: Was hard, no? From outside is difficult to appreciate how difficult is to play well here with these conditions today. I think for moments was okay, but for another moments play with the wind. You know, from the right to the umpire, from that sun, was very, very difficult, no? You feel scared to hit the ball because was crazy wind and a lot of changing directions all the time. So was very difficult, no? I don't like to play with wind, but I think when there is wind outside is not the bad news for my game. Q. Do you feel like the confidence is back, or are you still having a few little doubts during the match? Talk about how you think you might feel during the final, whether you you'll be able to play the best game that you have. RAFAEL NADAL: Seriously, being in the final of Roland Garros you can't have problems. You cannot have doubts. If we talk in terms about the level, no, doubts about win, lose, everything, the doubts is part of the life, so is part of the sport. Is nothing. I think everybody have that, and I'm not an exception. But if you compare from now to one week ago, is completely different. Q. As you are 25 today, how do you look back on your career thus far and what you've accomplished? RAFAEL NADAL: Last couple of years? Q. Since you became pro. RAFAEL NADAL: Well, is nine years ago already, so long time here flying around the world. You know, a lot of things changed. What never changed is the illusion to keep playing tennis, the illusion to keep doing well the things, and the illusion to be in a good position of the ranking and play these kind of matches like today, or the kind of match that I gonna play on Sunday. Q. If that's not what you said, the question was based on that. So I have no question. RAFAEL NADAL: Better for me. (Laughter.) No, because I read that, and I don't know where. Q. How old do you feel now, Rafa? RAFAEL NADAL: I feel 25. (Laughter.) Not on court, but outside of court, yes. Q. Could you talk a little bit about Murray and how difficult he is to play on this surface and every surface and how he is improving as a player, do you think? RAFAEL NADAL: You know, I always liked a lot Andy like a player, like a person. So, you know, every time that I beat him in these kind of matches, I feel sad for him, because he deserve to win a Grand Slam for sure. In my opinion he gonna do it. I still believe that he gonna do it, for sure, because his level and his talent is fantastic. Remain a little bit of luck sometimes, but he's improving in every surface. I always said he's a very complete player, and he has the chance to play very well in all the surfaces. Clay is not an exception. He's doing better and better every year. He had a fantastic clay court season. Right now start grass for him. I think he's a good player on grass, and especially on hard later he will have very good chances to have a fantastic year. Q. Do you expect Borg to be in the stands for the final? Because you know you can equal his record in Roland Garros. RAFAEL NADAL: No, no, for me, seriously, I don't think about that. A lot of respect for the great Bjørn, but I am focus on try to play well. For me, is much more important win Roland Garros than equal Bjørn. If Bjørn around there I would be happy to say hi to him, but not for that reason he must be here, you know. Q. Congratulations. Happy birthday. Again, congratulations for this match. It was very intense against Murray. Murray fought hard, and the wind was blowing in all directions. It was probably something tough. RAFAEL NADAL: Yes. Well, thank you very much. That's true. We can say it was a very intense and varied match. We had different chances and occasions to seize. As you know, we've played three sets. We've played a bit more than three hours, a bit more than an hour per set. So very long rallies. We have played many rallies and very long games, intense moments and complicated situations for him, but also for me. Therefore, I think that this match was a high‑level match. I think I played really well the first set mainly, until we arrived at 5‑1. That's when I played really at a high level. And then my game went down a little. I played more flat shots along the lines and I made a few mistakes; whereas I could have ended the set earlier, I think. But anyway, I managed. The match was tough. I was always leading, I think. I had the upper hand throughout the match, and whenever there was an obstacle, I managed to overcome this hurdle, even though I missed some type of control, which is normal against a player like Murray. Yet I think I managed to dictate the game, so all of this I think is very positive. Q. You've started celebrating the victory already? RAFAEL NADAL: Of course I'm happy. Q. Now that you've reached the finals, this probably is something special compared to other finals. RAFAEL NADAL: I was saying each week is different. Each day is different. Each time I'm here to answer your questions, I'm telling you the truth. That is what I feel. Each time I'm in front of you, I'm telling you the truth. To start with, in the tournament I was not playing that well. I was saying at the time, I have to change the situation, I have to have a better attitude, otherwise I could walk back home is what I said. But, fortunately, things have changed for me, and I was very present on the crucial points. It was positive for me, and I'm going to celebrate, because reaching the finals of Roland Garros is not something easy. Well, you know, this is something that people would dream of, reaching the finals. Nobody's ever certain that they can reach the finals. Today this is a dream come reality to me. I'm really happy to be playing the finals for one of the most important tournaments in the world on clay, so I have all the reasons to be satisfied. As you know I've had to overcome very difficult situations in the past one‑and‑a‑half weeks. I have reached the finals, that's true, and I'm very happy. I had to forget about this type of anxiety or the fears I had something like two weeks ago, and now I have gained more confidence. Well, during the first rounds, the first round, the second round, I was not feeling that confident. I thought I shouldn't lose any of these matches; otherwise my ranking is going to be impacted. But now I have more confidence. I think I fought for all the important points. I have no fears concerning my ranking any longer. It's not going to go down, so to me this is a splendid year. This is what counts. This is what I'll take away with me, what I remember, a very good year. I'm really very satisfied. Maybe I have had a few incidents, but apart from this I'm really, really happy. The rest does not really matter. I remember the positive sides. Q. Now, out of curiosity, when it was 6‑4, 6‑5, you've not changed your racquet. Have you realized this? Maybe you have not realized this. It was 6‑4 and then 7‑5 and then 2‑0. RAFAEL NADAL: Were there new balls when we reached the 2‑0? RAFAEL NADAL: Well, I don't realize. Yes, I think so. I think I changed my racquet when the balls were new. Every eight games I change my racquet. I don't think I made a mistake. For instance, 4‑3 ‑‑ no, no, no, I changed my racquet. When I serve I never change my racquets, but it's on my return games that I change my racquets. Q. This was probably a special day for you because it's your birthday, and also because you've reached the finals. How did you manage your emotions, your feelings? Since now you're reaching the finals and it's your birthday, how can you manage all this? How can you live up to all these things? RAFAEL NADAL: Well, you know, six finals, so that's why I can manage my emotions. You can play well or play poorly, but it's easy to manage emotions when you have enough experience. I have enough temper. I am the person who can manage his emotions. As I said, I have plenty of experience to manage these types of emotions, these types of feelings. In any case, you have to, whether you win or whether you lose, you know that the week after is going to be different. I'll be playing Queen's if I lose this tournament, and then next week I have another opportunity to win. If you lose, you have to go back home and start again. The feelings are the same. I try and manage them and control them. I'm very happy and satisfied. When I look at all that I've accomplished, I'd like, by the way, to thank all of those who supported me, surrounded me. Thanks to them, I'm here now. Q. I'd like to ask you a question concerning the break points. We had 18 break points, and you've saved 15 out of 18 break points. Now, another player could have done perhaps not as well as you. RAFAEL NADAL: That's true. I had 18 break points against me. I saved 15. But I'm not worried, even though I saved 15, because I try to pay attention to my service game and not serve too strongly. I try and serve differently with more spin in the ball, perhaps more slowly, and then I play on my forehand. If the balls are a bit too deep, then I have to make a few adjustments. I have to play a wee bit more slowly. In some cases I was in an awkward situation because he was returning too fast, and that was a problem for me. So that's when I think I have to slow down the game to start with, to slow down the game and the pace. Now, having said this, that's true, there were several break points, and he played really well. Well, it was not really a problem for me. I managed to save many of those, and I had to serve mainly on the lines. The moment when I broke him I had problems, otherwise I didn't really have any problems with my service game. It's just after the break. That's when I started having some difficulties. You know, when you have to convert your break point. Q. I'd like to ask you something, Rafa, which is, now that you're 25, what, according to you, is the difference between the 25‑year‑old Rafael and the 19‑year‑old Rafael? I have another question: You've beaten a record. You will be the No. 2 player here who's won Roland Garros several times. RAFAEL NADAL: Well, each player is different; each career is different. There's nothing special about this. You might be rated No. 1 or No. 2. Well, if you look at the past 10 years, so many things have changed that I think this doesn't really matter very much. It's an anecdote. During the tournament, it's not necessarily the No. 1 player who has to win the tournament. Each tournament is different, and each tournament has its own challenges. When you're on the court, you know that you might lose as well as you know that you might win the match. It varies daily. Now, you've asked another question that is what about Rafael today and Rafael seven years ago? Well, when you're 18 and when you win here for the first time, what you think about is, Oh, okay, I've won one match. Now, maybe it's going to be easier in my career now, but I can tell you that this is not at all the case. This is a lie. If you win, there's more pressure on you. There's even more pressure on you. When you win, you want to win more matches. The fact that you have reached the finals is something you want to repeat. It's always renewed. The appetite is still there. It's an incredible feeling, and I'd like to continue on the same path. Q. Now, if Djokovic is going to play against you on Sunday, do you think he's the favorite? RAFAEL NADAL: Yes. I would be very happy. He's the favorite, that's true. But not just Djokovic, you know. I don't really believe in these favorites, you know. But anyway, if it's Djokovic who is the favorite, then I can say that that's true. He's not been defeated at all recently in a long streak of matches, so he deserves this.